Analysts from Scotland were called in by the Waldhaus Am See hotel in St Moritz after experts questioned the authenticity of the 2cl shot. It is believed to be the largest sum ever paid for a poured dram of Scotch. But analysis found that it was almost certainly not distilled before 1970. The hotel said it had accepted the findings and reimbursed the customer in full. Zhang Wei, 36, from Beijing - one of China's highest-earning online writers - had paid just under 10,000 Swiss francs (£7,600, $10,050) for the single shot while visiting the hotel's Devil's Place whisky bar in July. But suspicions about the spirit's provenance surfaced soon after the purchase, when whisky industry experts spotted discrepancies in the bottle's cork and label from newspaper articles. That prompted the Waldhaus to send a sample to Dunfermline-based specialists Rare Whisky 101 (RW101) for analysis. Carbon dating tests were then carried out by researchers from the University of Oxford, which suggested a 95% probability that the spirit was created between 1970 and 1972. 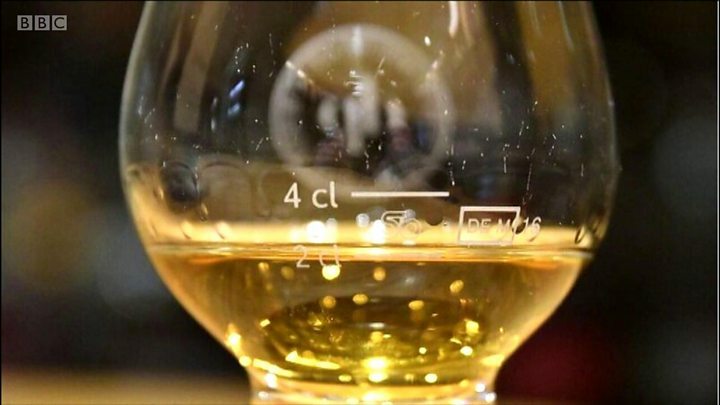 Further lab tests by Fife-based alcohol analysts Tatlock and Thomson indicated that it was probably a blended Scotch, comprising 60% malt and 40% grain - ruling it out as a single malt. RW101 said the tests had shown that the bottle was "almost worthless as a collector's item". Had the bottle been genuine, it would have carried a bar-value of about 300,000 Swiss francs (£227,000). Mr Zhang, who writes martial arts fantasy novels under the pen name Tang Jia San Shao, earned the equivalent of about $16.8m in 2015, according to China Daily. He bought the dram while on holiday with his grandmother at the Swiss hotel, which stocks 2,500 different whiskies. Waldhaus manager Sandro Bernasconi told BBC Scotland that the hotel had no idea the bottle was a fake. He said: "My father bought the bottle of Macallan 25 years ago, when he was manager of this hotel, and it had not been opened. "When Mr Zhang asked if he could try some, we told him it wasn't for sale. When he said he really wanted to try it, I called my father who told me we could wait another 20 years for a customer like that so we should sell it. "Mr Zhang and I then opened the bottle together and drank some of it." A few days after tasting the whisky, Mr Zhang posted a message on the Chinese micro-blogging platform Weibo about his experience. He wrote in Mandarin: "When I came across a fine spirit from over 100 years ago, there wasn't much struggle inside. "My grandma who accompanied me on this trip was only 82, yet the alcohol was 139 years old - same age as my grandma's grandma. "To answer you all, it had a good taste. It's not just the taste, but also history." Mr Bernasconi broke the bad news to Mr Zhang when he flew out to China to reimburse him recently. He added: "When I showed him the results, he was not angry - he thanked me very much for the hotel's honesty and said his experience in Switzerland had been good. "When it comes to selling our customers some of the world's rarest and oldest whiskies, we felt it was our duty to ensure that our stock is 100% authentic and the real deal. "That's why we called in RW101. "The result has been a big shock to the system, and we are delighted to have repaid our customer in full as a gesture of goodwill." RW101 co-founder David Robertson said: "The Waldhaus team did exactly the right thing by trying to authenticate this whisky. "We would implore that others in the market do what they can to identify any rogue bottles. "The more intelligence we can provide, the greater the chance we have to defeat the fakers and fraudsters who seek to dupe the unsuspecting rare whisky consumer."